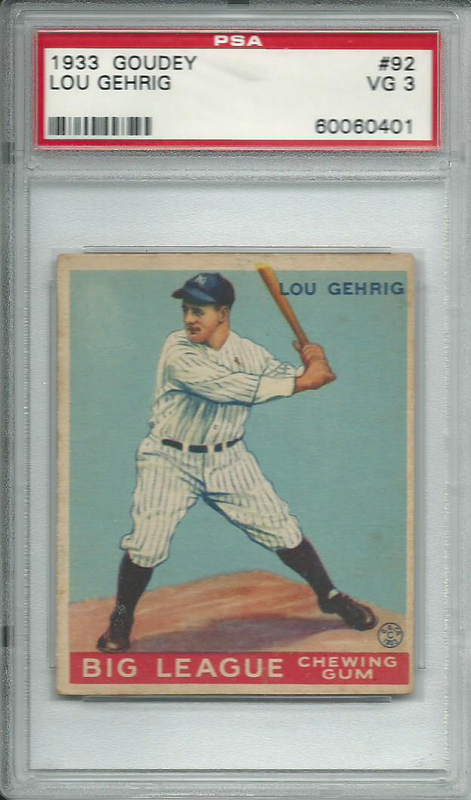 The last day of the month and I came across two realizations today, one… I had not posted a Vintage Card of the Month post and two… I have never posted my 1933 Lou Gehrig Goudey as the Vintage Card of the Month (serious oversight by me). For years baseball cards had been included in tobacco products and candy products but besides the 1909-11 T206 set no other pre-war set stands the test of time like the 1933 (and 1934) Goudey cards. 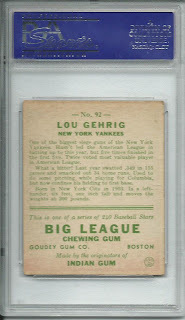 In 1933, in the middle of the Great Depression, the Goudey Gum Company decided to include a baseball card with each stick of gum, becoming the first company to include cards with gum, in hopes of getting kids to buy their gum with the few coins they were able to collect. 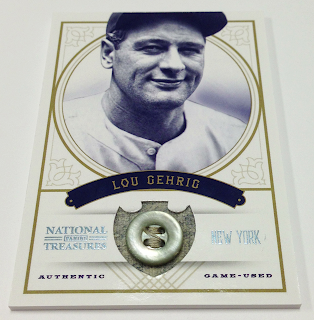 The set was heavy on stars with a number of players having multiple cards including Babe Ruth and Lou Gehrig. The set became known as the 1933 Goudey Baseball Cards set, designated as R319 in catalogs. 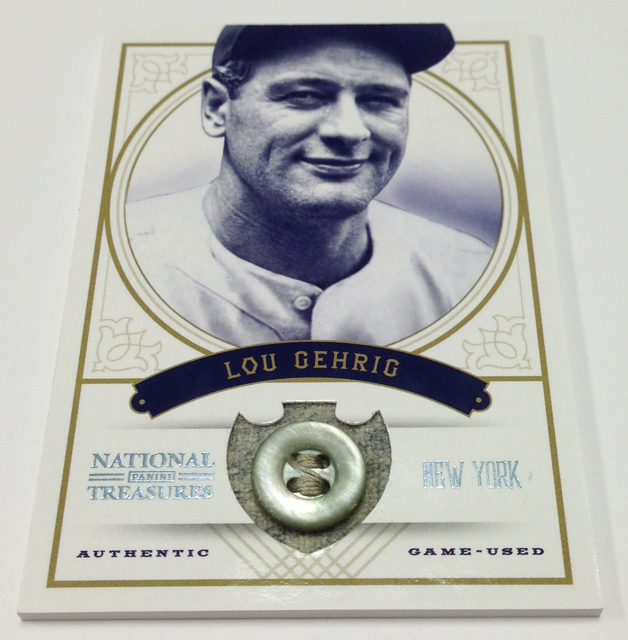 Lou Gehrig is one of my idols, he was honest and sincere. He actually cared about family, fans and his teammates. He is probably known more today for his consecutive games streak but he was much more than that. In 1920, when he was 17 years old, his high school team traveled to Chicago to play a game in Wrigley Field, he knocked a grand slam out of the park (literally). After high school he earned a football scholarship to Columbia University but he only played football his freshman year, in his sophomore year he played First Base and Pitcher for Columbia and in a game in 1923 game he struck out 17 batters. Pro teams were knocking down his door to sign him; he ended up signing with the hometown Yankees (so he could give his parents the signing bonus because they couldn’t afford their bills) and 2 months after signing his contract he was in the big leagues. In 1925 he went in to a game to replace a struggling Wally Pipp at First Base, the first game of his 2,130 consecutive games streak. Over 17 years he played through injuries, including getting hit in the head three times, because he did not want to let his teammates down. In May 1939, after struggling in recent games, he approached Joe McCarthy, the Yankees manager, and said he was benching himself for the good of the team. He retired a month later, a week before the 1939 All-Star Game. He died two years later, 16 years to the day after he replaced Pipp at First Base. This card is not the oldest card in my collection but it is my favorite card by far. I picked this card up in 2006 from 707 Sportscards, their web site is ugly as sin but their prices are pretty decent for vintage singles. 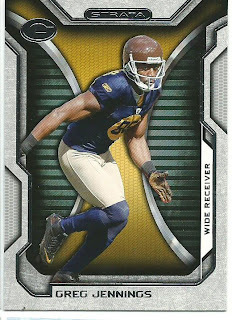 I grabbed a blaster of 2012 Topps Strata Football, a new 2012 mid-level brand for Topps. The base cards have a mechanical design, almost as if they were designed by engineers, and are outlined with foil. 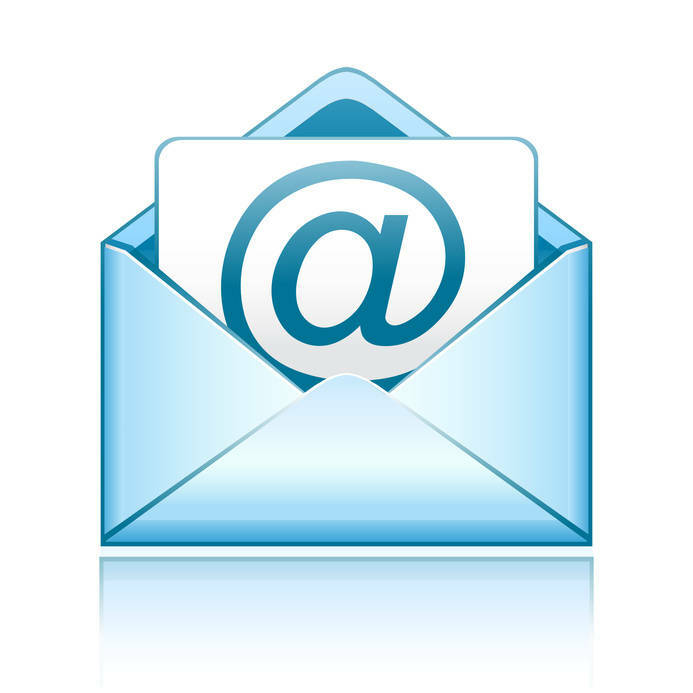 The fronts include an action shot of the player, their name, team logo and position. The backs continue the mechanical styling and include the standard player bio, last year’s stats (college or pro) and 4 Strata-Spheric Stats about the player. A couple of things of note about the product, almost every card (base and inserts) in the set has a parallel or variation, retail base cards are on a thinner stock than the hobby cards and retail rookie cards are different from the hobby versions. I only pulled three players from the Seahawks and Cardinals, Marshawn Lynch and Robert Turbin from the Hawks and Kevin Kolb for the Cards. I actually pulled duplicates of Kolb and Turbin. In all I pulled 8 duplicates out of 8 packs, pretty bad collation. 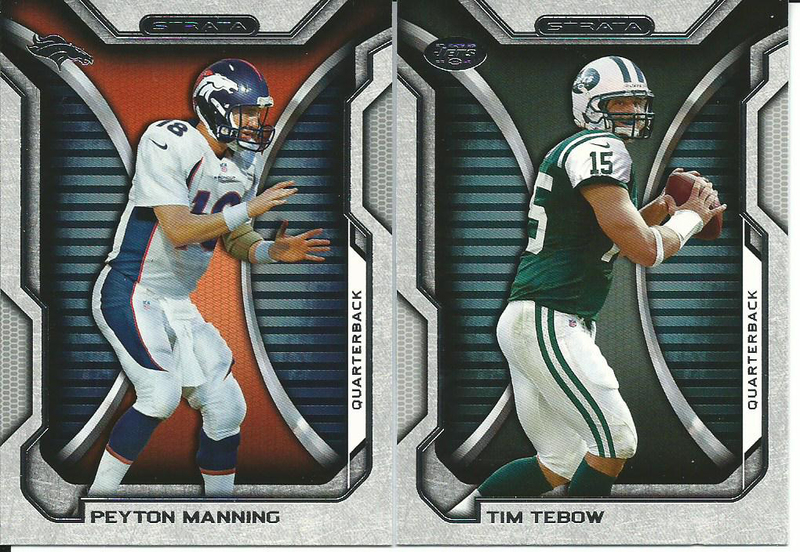 A couple of guys in their new uniforms, to bad Tebow fans did not get much of a chance to see him play in 2012. I think that card companies should include more throwback uniforms in their sets, even as a variation/SP card. 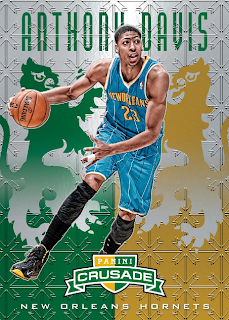 I know that some of the throwback uniforms are pretty bad but I think many collectors would be pretty excited to chase down their favorite players in a throwback jersey. 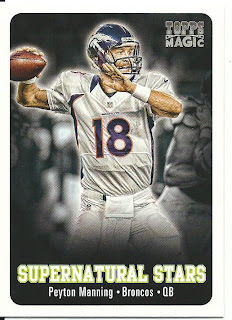 I pulled 20 rookie cards, not bad when you figure that is 2.5 per pack, the problem being that there were 5 duplicates. 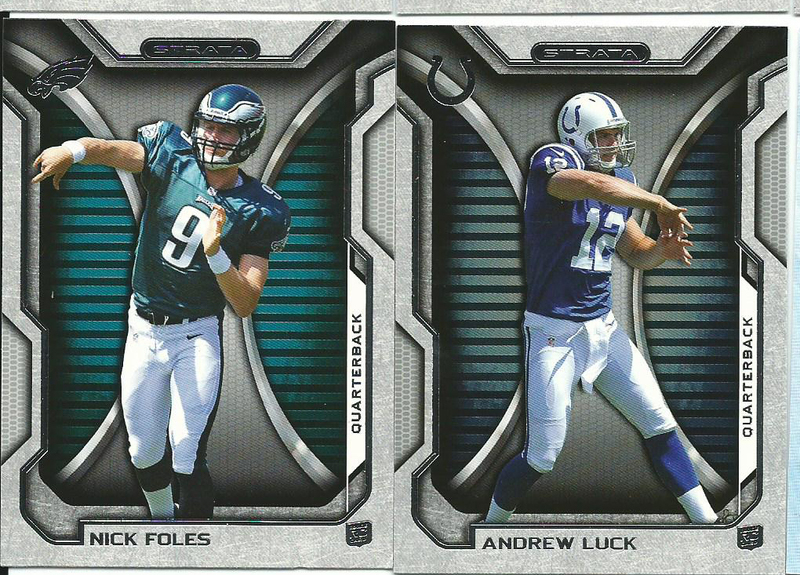 In the end though I pulled three of the five rookies I was hoping to pull; Nick Foles, Andrew Luck and Robert Turbin. 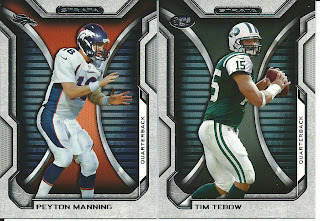 In all it was a nice break, I like Strata Football and I am considering picking up a hobby box. 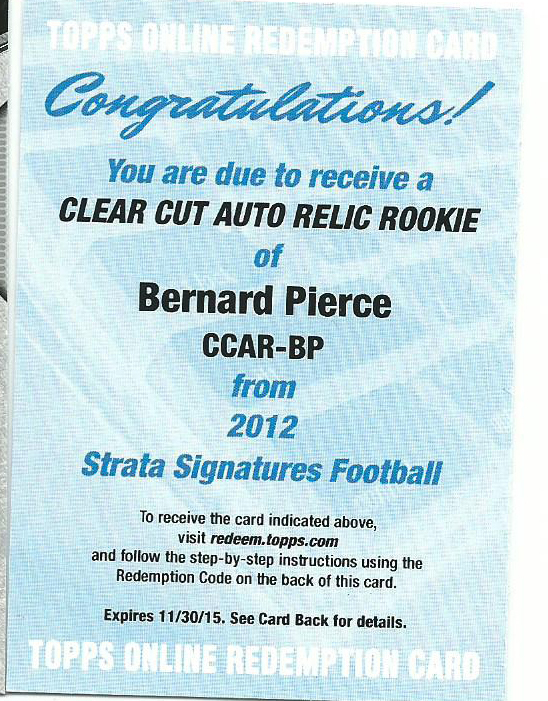 I did end up with a nice bonus, a Bernard Pierce Clear Cut Auto relic Rookie redemption card. 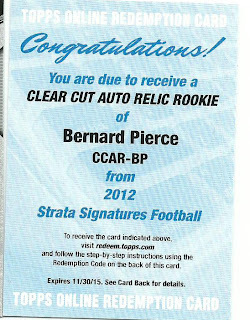 Pierce is not a huge hit by any standard, but the Clear Cut Auto cards are extremely cool and with odds at 1:445 retail packs (1:56 blaster boxes) this was an unexpected and pleasant surprise. 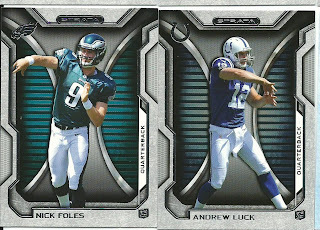 I decided to pick up some football cards just for the heck of it to have a variety in between my baseball and basketball pack ripping. 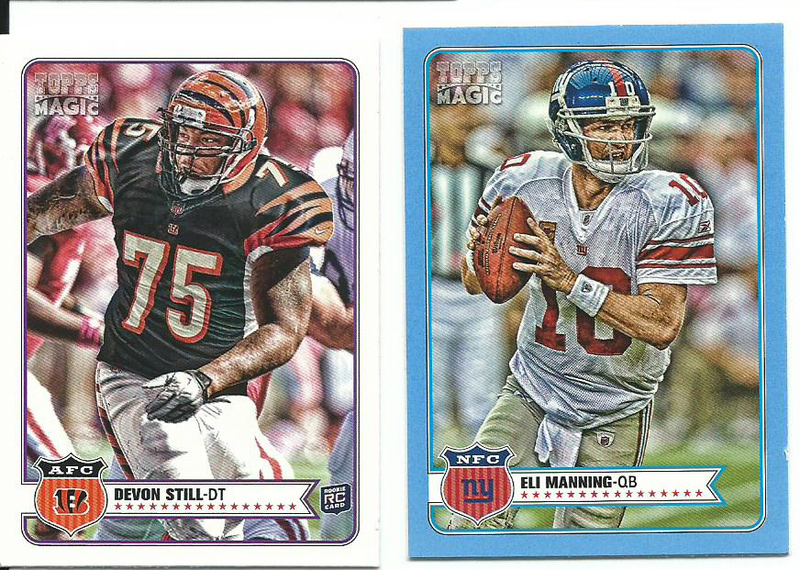 A jumbo rack pack 2012 Topps Magic Football and a blaster of Topps Strata Football. 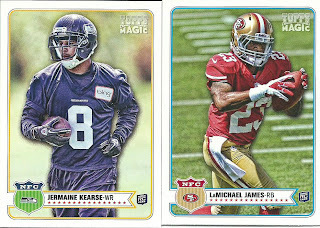 I will start with the Magic Football rack pack, which came with three packs with each pack containing 5 base cards and a mini card. 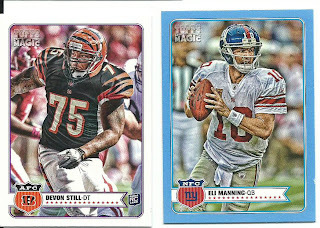 The rack pack also includes 3 retail-exclusive blue parallel mini cards. The design is the standard animation-style Magic card, a nice action card along with team logo, conference, player name and position. 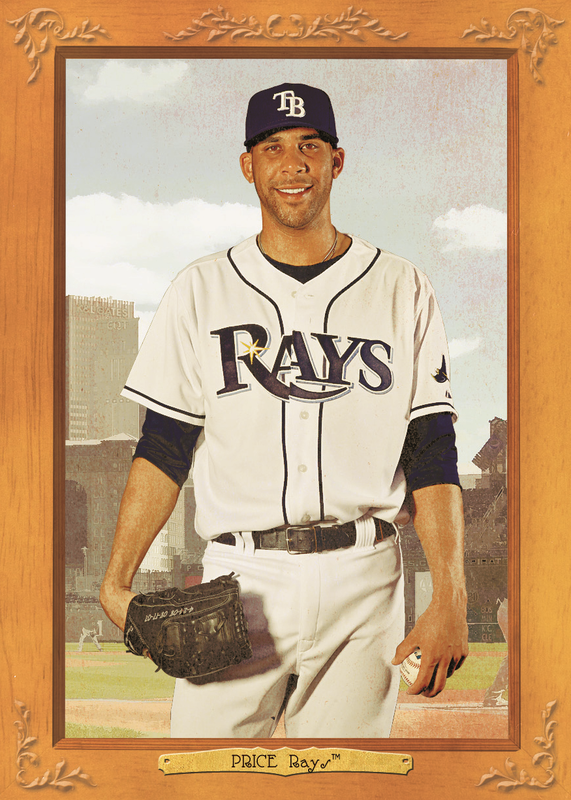 I do like the simplistic design, I think Topps is keeping a simple design to highlight the player and it really works. 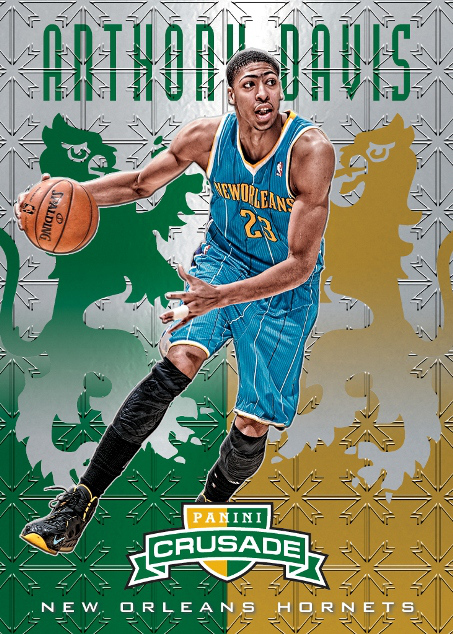 The backs are similar to previous years with player bio and each player has a “Magical Memoranda” which includes some player trivia. I did not pull anything magical (pun), only one Seahawk and no Cardinals. I lead off with the undrafted Jermaine Kearse; his 7 receptions for 31 yards may not even keep him on the roster next year. 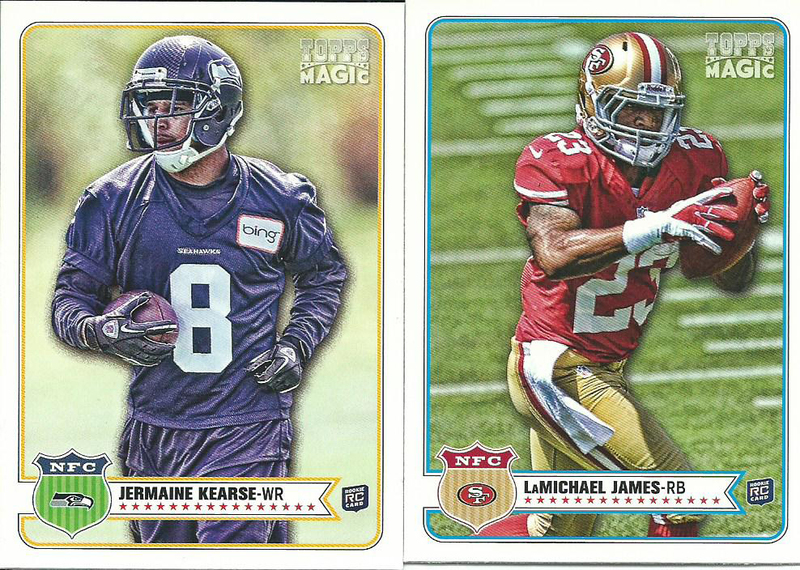 LaMichael James was about the BIGGEST name I pulled, and while he only got in to 4 regular season games (in an over-crowded 49ers backfield) he ended up playing in 7 games, counting the final 4 games of the season and 3 playoff games, with 809 yards of total offense and a touchdown. Sadly his 2012 performance may be best surmised with the fumble in the Super Bowl. We will definitely see more of him next season. 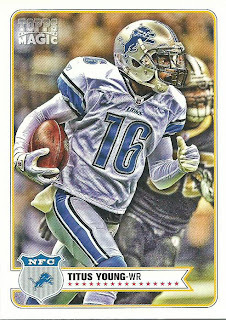 I was lucky enough to pull the card of future Hall of Famer Titus Young. In 2012 this head case had three team incidents resulting with 3 suspensions and instead of shutting his mouth he decided to turn to Twitter to air his grievances and demand his release. Detroit granted him the release, St Louis took a chance and signed him but within 7 days the Rams cut him and now he has cleared waivers and no team has shown any interest since he was released. Way to talk your way out of a pay check there Mr. Young. The mini cards are just like the base cards… just cuter. 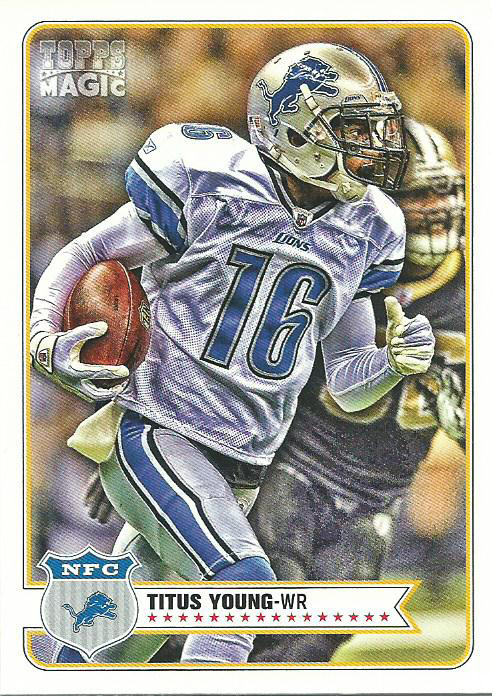 The blue parallels are a retail exclusive parallel. I do not expect to pick up any more packs of Magic, they are ok but I just don't feel the urge to collect the set. I will try to get through organizing the Strata packs and scan them tonight so I can do a write up tomorrow. 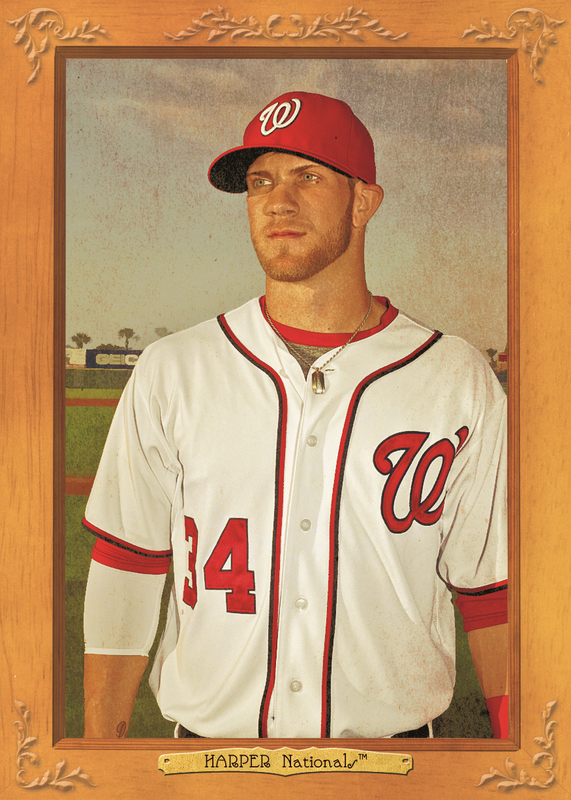 2013 Topps Finest Baseball... Bigger, Better and Retro! 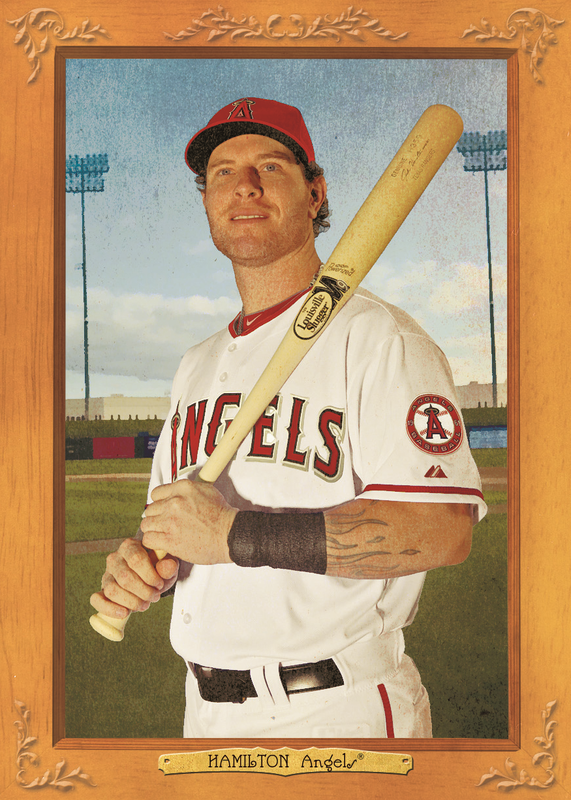 When Topps releases 2013 Finest Baseball in August they will be celebrating 20 years of Finest. 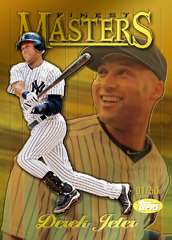 They will be bringing a touch of the past in to each 12 pack master box. With a similar pack out to the 2012 release (2 mini boxes per master box, 6 packs per mini box, 5 cards per pack), the price will probably be pretty similar. 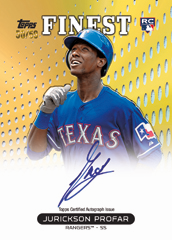 Each master box will include one Autographed Rookie Refractor and one Autographed Jumbo Relic Rookie. While the 1993 Finest set may not be the “prettiest” Finest product ever released this set holds dear to my heart. I got back in to collecting in late 1992 (basketball only at first) and the 1993 Finest Baseball was one of the first baseball releases that I started to bust. 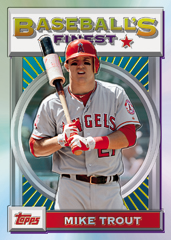 I wanted the Griffey All-Star Refractor so bad but it has eluded me to this day. 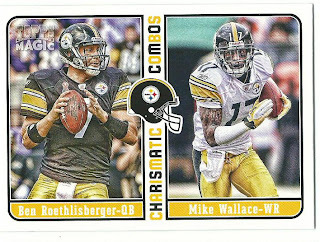 The 100-card base set has the typical Finest chrome/reflective surface with a dot-like background design with the dots in the team’s colors. 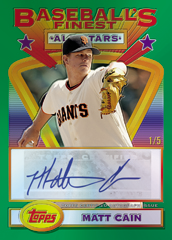 The checklist will be made up of veterans and rookies and each base card will have 9 parallels: Standard Refractor (No #), X-Fractors (No #), Green (#/199), Orange (#/99), Gold (#/50), Red (#/25), Atomic (#/5), SuperFractor (1/1) and Printing Plates. 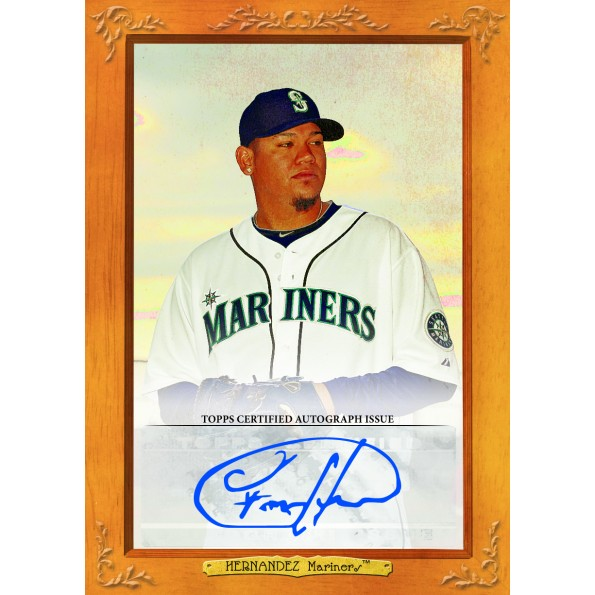 The Autographed Rookie Refractor cards are designed like the base cards with the chrome surface and a team colored dot pattern with a white fade/mist on the bottom. 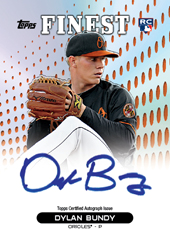 The preview cards appear to be on-card signatures. No checklist has been released yet. 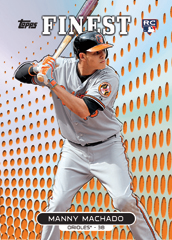 There will be 9 different parallels to each base card: X-Fractor (#/149), Green (#/125), Orange (#/99), Gold (#/50), Red (#/25), Atomic (#/5), SuperFractor (1/1) and Printing Plates. 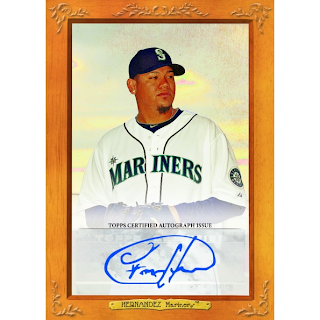 The Autographed Jumbo Relic Rookie cards are horizontal so they can include both a large jersey swatch and the sticker autograph. No checklist has been released yet. There will be 9 different parallels to each base card: X-Fractor (#/149), Green (#/125), Orange (#/99), Gold (#/50), Red (#/25), Atomic (#/5), SuperFractor (1/1) and Printing Plates. There are additional inserts that are based on cards from 1993, 1996 and 1997 as well as a couple of upper end hits. 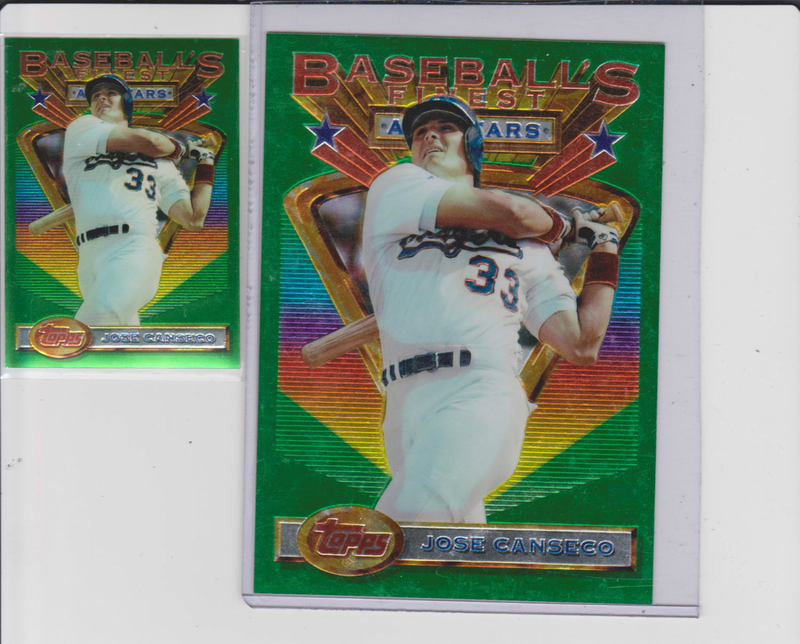 This card image I pulled from eBay to show the comparison between the regular All-Star Refractors and the Jumbo All-Star Refractor Box Topper. 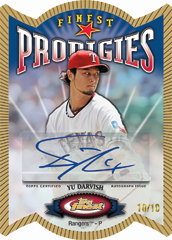 I have not seen a final checklist so I do not know if Canseco will be included plus the Buybacks in the 2013 release will be autographed. 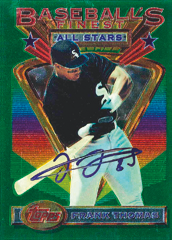 Topps closes out with random Hot Boxes, an entire box filled with the 2013 Topps Finest Baseball 1993 Refractor inserts. 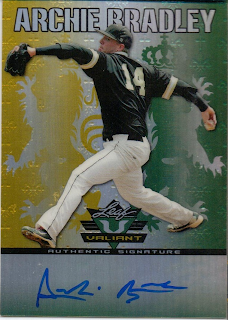 I must be having a déjà vu moment when I was reading up on Panini’s new Crusade Basketball… or maybe I saw the same exact design when I reviewed Leaf’s 2013 Valiant Football last week or it could have been 2 years ago when Leaf released the 2011 Leaf Valiant Draft Baseball set. Panini even made an additional post on The Knight's Lance blog after the original announcement of the upcoming set explaining the history of the card design showing that it is separate from Leaf's Valiant designs. 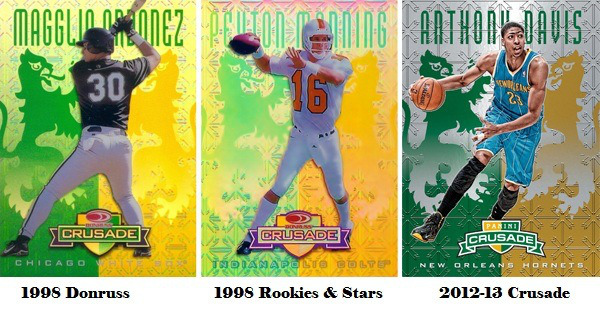 I do like the design because it is a reminder of the crazy sets of the 1990s and I would consider buying both Leaf’s and Panini’s products but there will be collectors out there making noise about the similar designs. The upcoming WWE set is built off of the 2013 Topps Baseball design, which works decently here. 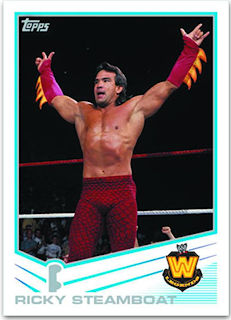 The complete set consists of 210 cards and is broken down in to 110-card base set, a 90- card Triple Threats set and a 10-card Diva Centerfolds set. The base set will have 3 parallels; Black, Silver and Gold plus printing plates. 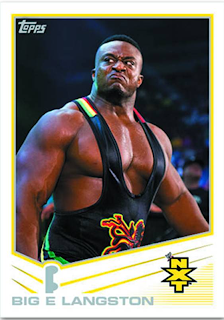 The Triple Threats cards are a 30-card checklist with each wrestler having three levels depicting those wrestlers’ specialties. 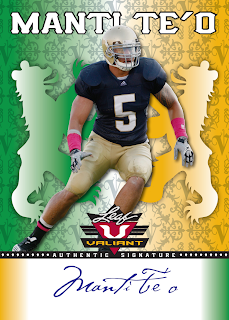 For example Sheamus’ cards are White Noise, Irish Curse and Cloverleaf. Threat 1 cards are more common and Threat 3 cards are the rarest. The Diva Centerfold cards are a 10-card checklist that focuses on the WWE Divas, the cards are die-cut and you can fold them to stand them up. 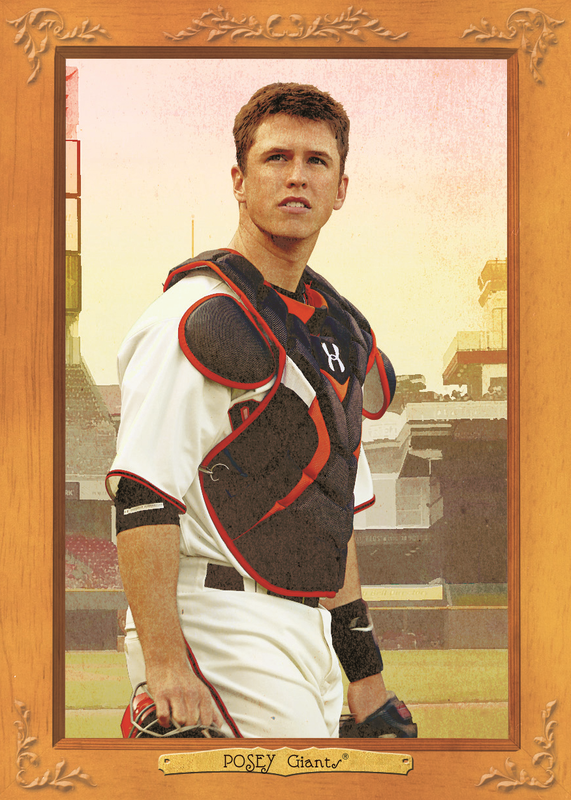 The hits are made up of a base autograph, which is built on the base cards with an autograph sticker added. There are three relic sets, the main relic insert is the Summer Slam 2012 Mat Relics which contain a piece of the mat used at Summer Slam 2012, the Triple Relics contain 3 relics and the Diva Kiss insert uses the Diva Centerfolds checklist but includes a kiss autograph from the Diva. 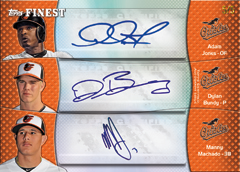 Topps included an image of the 2012 Kiss autographs in their sales materials so I am not certain what they will look like when released. The checklist includes a nice selection of superstars and legends so collectors should be happy and at $50 a box it is a pretty cheap box break. 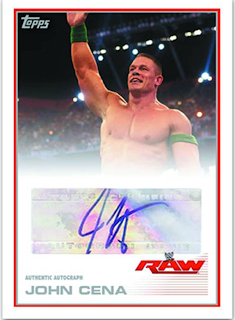 Topps was able to keep the price down with sticker autographs, re-using the baseball design and using a mat relic as the main hit so this would be a product more for the everyday WWE fan and set builders. This is along the line of something I would pick up to break with my son just for fun. 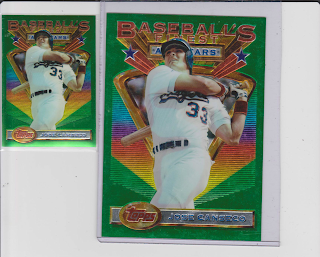 I give this set a decent 3.5 out of 5 based on the premise that this is a basic set so I am rating it on what Topps set out to do with it, make casual collectors, set builders and kids happy. I think going with a relic specific to a wrestler would have made it better, such as a shirt worn by the wrestler instead of a mat piece which was used by all of the wrestlers. Everyone loves a good battle between super heroes and super villains and Rittenhouse Archives has taken that idea and built an entire set around it with the upcoming Marvel Greatest Battles, scheduled to be release April 17, 2013. Each box, prices seem to range between $90-120, will include 24 packs with 5 cards in each pack. 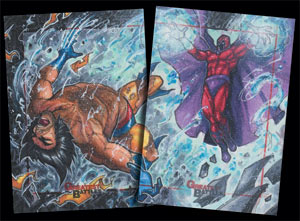 In addition to two sketch cards per box you will also pull a variety of inserts and parallels. 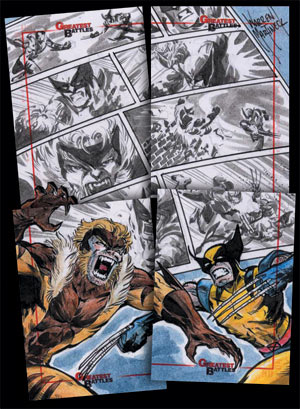 The 2 sketch cards can be put together to create a battle scene, some of the combatants are Spider-Man vs. Green Goblin, Fantastic Four vs. Doctor Doom and Thor vs. Loki. There have been some great battles in the annals of Marvel history, both in books and in movies, limiting the set to only 90 cards must have been a difficult task especially considering that Marvel has been around for nearly 75 years. One thing that bothers me with sets based on comic books, because the sets usually include sketch cards Rittenhouse (and Cryptozoic too) usually only preview the sketch cards leaving collectors to wonder what the base cards, parallels and inserts all look like. I know that the sketch cards are the big draws by I would love to see what else comes in the box. The sketch artist list is pretty solid, some of the announced names so far: Mick and Matt Glebe, Anthony Tan, Cezar Razek and one of my favorites, Andy Price. As usual Rittenhouse is offering case incentives, with 6 cases you get a 2-card puzzle sketch from Meghan Hetrick, when you buy 9 cases you get a 4-card puzzle sketch from Warren Martineck and if you buy 18 cases you get an Archive Box (includes 20 sketch cards, an entire 90-card red parallel base set, the complete 18-card Avengers Vs. X-Men insert set, entire 9-card Battle Scars insert set and the entire 9-card Gold Plastic insert set plus 2 case topper cards). 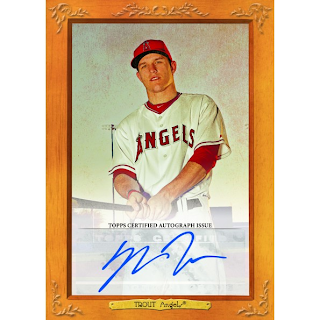 Topps began pre-selling 2013 Turkey Red Baseball on Tuesday (Feb 12), it goes live February 18th, and within hours it was sold out. 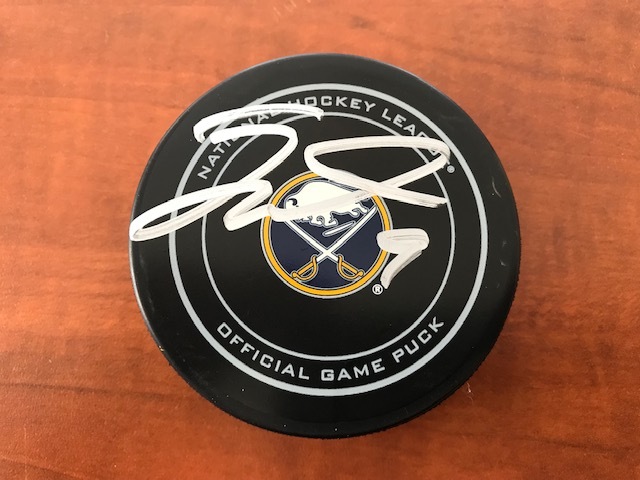 Even at $20 for 10 base cards and an autograph did not stop people from buying in on the product. What is scary is that there are 6 pre-sell boxes up for auction and the cheapest one, with 7 bids already, is at $31 and a couple of days left. 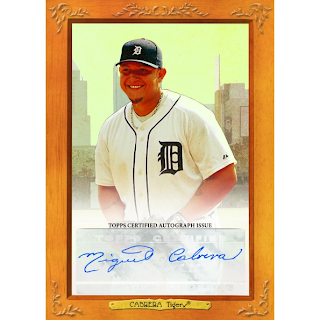 Complete base sets (no autographs included) are posted at $300 BIN and over. 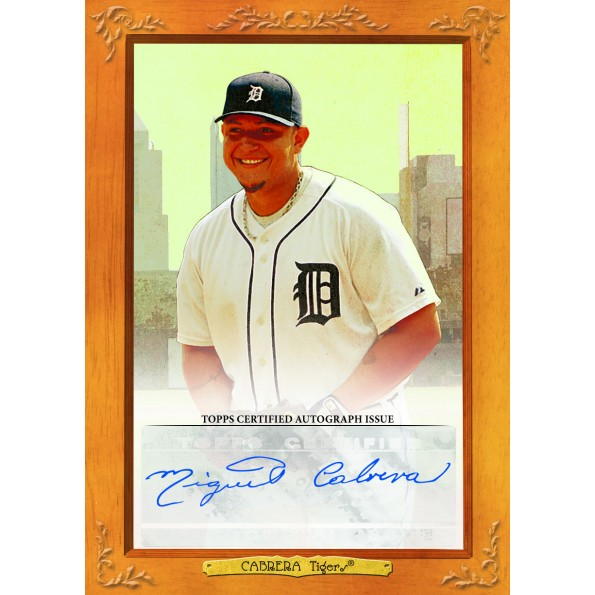 I know that some collectors questioned the idea of charging $20 for 11 cards but Topps seems to have hit the target with another online exclusive release. 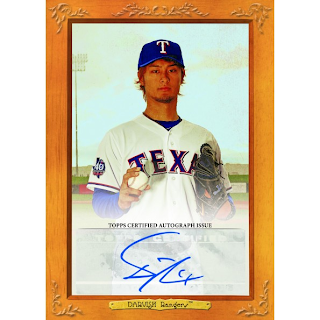 I think the mixture of a limited release, online exclusive, parallels and decent group of young signers has drawn in the gamblers willing to drop $20 for the chance of pulling a gem. I can’t wait to see what prices hit when the product goes live.